January 5, 1954 Bryan Keith Hitt was born in Center, Texas. Coming from a large family, Bryan is the fifth of seven children; two sisters and four brothers. 1954-1972 Bryan grew up in the nearby town of Joaquin, Texas. At the age of ten and inspired by the likes of "Cubby" on the Mouseketeers, Ricky (as played by Keith Thibodeaux) of the I love Lucy Show, and Ringo of the Beatles, Bryan joined the fifth grade school band and took up drumming along with about twenty or so other ambitious fledgling percussionists. Like the others Bryan started out by tapping out on a practice board and learning the fundamentals of beat, timing, and drum rolls. By the start of the sixth grade school year, Bryan was the only student that played the snare drummer in the high school band. It was at this time in his youth that Bryan began to discover that he had an ability that separated himself from others. This gave him the confidence to continue on and pursue his love of playing drums. Later Bryan was active in the school marching, concert, and stage bands. He was inspired by his band director, James Sprayberry, who introduced Bryan to many different styles of music and encouraged Bryan to practice hard and go for it.. At the age of fifteen Bryan replaced the drummer in the band of his older brothers. This was his first professional stint as the band played almost every week-end. This band was called the "The Solid Souls" and it exposed Bryan to soul music, the likes of James Brown, Otis Redding, Wilson Picket, and Sam & Dave. It was about this time that his step-father's oil-industry career took the family along with Bryan to Alaska. Bryan with his passion for music and playing drums, joined several other bands throughout high school in Alaska. There were not many drummers in Alaska and Bryan got to do some recording, played with country bands, mariachi bands, rock, jazz, and funk bands. Bryan's early years were marked with many influences and different musical experiences. This set the stage for the next phase of his life. 1972-1979 In 1972, Bryan graduated from East Anchorage High School. From that time to the age of twenty-six Bryan perfected his chops by playing in various groups in the Anchorage area. As his hard-hitting style develops, evolves, and comes into it's own, he is ready to take on the big-bad-exciting life of a professional rock and roll drummer. Setting up his kit, rockin' the locals, "hittin' 'em hard" for five to six hours a night, tearing down, and doing it again the next night; Bryan soon becomes a symbol of a hard working rock and roll drummer in the Anchorage music scene. Bryan recalls that his highlight in Alaska was opening for Ike and Tina Turner in the late 1970's. 1980 to 1986 It is with this spirit that in 1980 Bryan makes the move from Anchorage to Los Angeles where "Glam-Rock" along the Sunset Strip was beginning to blossom, and talent was uncovered every night in the local clubs and hang-outs. Poofy hair and make-up of the 1980 glam scene was a change from what he'd been used to in Alaska, but this drummer who would one day be pounding out Roll With The Changes would embrace the change and was ready for the task at hand. Bryan was in the thick of it. With his talent and drive, he was exactly where he needed to be at the exact right moment in time. However, it would take a few years for Bryan to "Hitt" full stride. Throughout the early 1980's Bryan continued to play in different bands and continue to grow as a drummer. In February of 1985 Bryan met his wife Cindi at the West LA club: Madame Wong's West. Cindi was there to support a girlfriend who sang there frequently (Bryan wasn't performing that night). Bryan and Cindi were engaged three months later. According to Bryan, Cindi didn't see him perform on stage until nine months after they started dating. Bryan and Cindi were married in March of 1986. 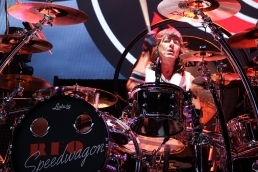 Cindi would provide the support Bryan needed as he continued to rise to become one of rock-n-roll's most established drummers. It was around this time in 1985 while in Los Angeles that Bryan (pictured bottom left hand corner in the photo below) got his first big break in his band Life by Night: Here is another photo with a different look of the band " Life By Night" ... Bryan is again pictured in the bottom left hand corner: The band signed a record contract under the Manhattan label and songs were recorded at Capitol Records in Hollywood, CA. When recording was complete, Life by Night released their self-titled album ... "Life by Night." The lineup included: Tom Croucier - vocals, bass Jeff Naideau - keyboards; guitars Stuart Mathis - guitars Kevin Anderson - keyboards Bryan Hitt - drums It's interesting to note here that keyboardist Jeff Naideau would eventually play with Bryan in Wang Chung's touring band as discussed below. Despite obtaining a record deal, the popularity of the band didn't reach Bryan's expectations, so Bryan eventually left the band. But Bryan kept pushin' and kept drummin' on! 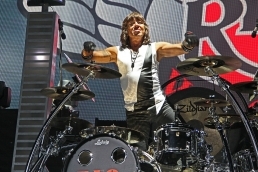 With his tight pocket drumming and precision rolls, his reputation as a hard nosed drummer continued to gain the attention of the industry. Not only did he play in many different bands during this time, but he did session work for several artists. Working for artist Jef Scott, who was big in Australia, Bryan performs on the 1986 release of "Ten Stories." The "Ten Stories" album cover: Bryan also made a mark with Stan Bush known for his "action themes" for major motions pictures such as the film "Transformers." Bryan appears on Stan's "Call to Action" CD: Bryan also played in the bands Barrage and Ambush. 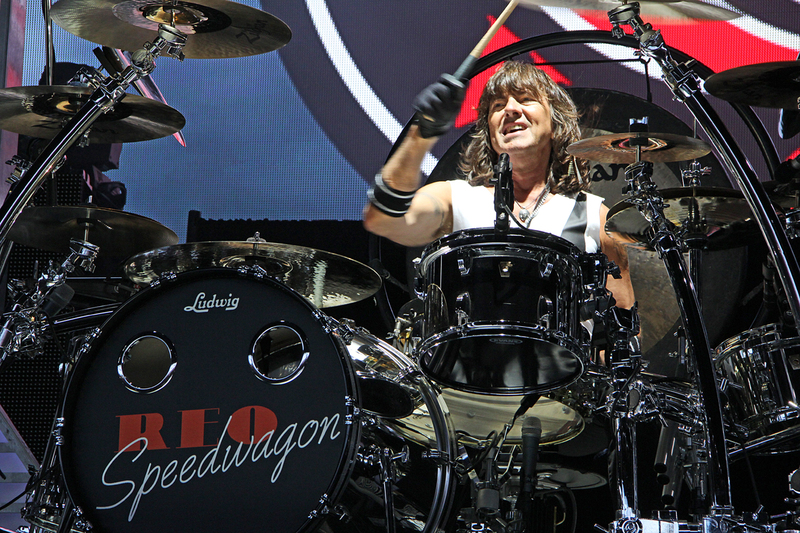 Both Barrage and Ambush were Stan Bush projects, but's it is interesting to note that Bryan played in Ambush with Dave Amato who he would eventually play with in REO Speedwagon. Before there was MTV, VH1, and American Idol, the TV shows Solid Gold and American Bandstand showcased the best up and coming talent. Bryan provided the backbeat to various artists that would appear on these programs. 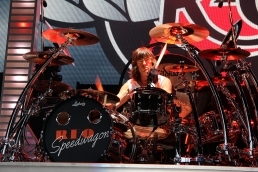 With his passions for drumming and his easy going personality, Bryan also appeared on the TV series "Hunter," in which he is seen not so surprisingly playing drums in a rock band. In addition to these television appearances, he can be seen playing drums in a few different movies, including Karate Kid III, and Nothing But The Girl. Among Bryan's other accomplishments were spots playing with such artists as Cher, Graham Nash, and The Spencer Davis Group. He also recorded with Nick Gilder and Gary Busey. Below is a pre-REO photo of Bryan: Bryan was constantly working and moving about. This would prepare him well as the drummer for REO Speedwagon; one of the hardest working and longest touring bands in the history of rock and roll. Times were not always rosy in the 1980's. Struggling a bit and in need of some cash, Bryan took a job at "The Drum Doctors." It did not pay much but Bryan was getting good exposure, making contacts and gaining experience. He did cartage and set ups for various drummers. One drummer included Jeff Porcaro. Jeff introduced Bryan to Peter Wolf, the producer and pianist for Frank Zappa and Lionel Ritchie. Wolf arranged for Bryan to do the Solid Gold TV show with Wang Chung. Peter had just finished producing Wang Chung's new record "Mosaic." Bryan would go on to play with Wang Chung for the next three years. 1987-1989 In January of 1987 Bryan teamed with the London based "new wave" band Wang Chung to form a complete touring band. The band needed a dependable-durable-dedicated-determined-drummer to handle the upcoming tour plans and Bryan was more than up for the task. Wang Chung was the invention of vocalist and guitarist Jack Hues and bassist Nick Feldman. In the mid-eighties the band scored monster hits with the songs, Dance Hall Days, Everybody Have Fun Tonight, and Lets Go, with the latter two being both off the Mosaic album. In order to promote the Mosaic vinyl a touring band formed. The band included three musicians from the United States: Bryan on drums, Debra Dobkin on percussion, and Mikal Reid on guitar, along with UK saxophonist Martin Winning, and UK keyboards Graeme Pleeth. As the story goes: halfway through the tour, Graeme Pleeth had to leave the band. However, upon the recommendation of Bryan, the now late Jeff Naideau, a classically trained musician, New Orleans Jazz great, former "Life By Night" band member with Bryan , and friend of Bryan slipped in to finish out the second half of the successful tour which consisted of five February 1987 U.K. dates including a February 10 and 11th gig at the The Marquee in London. Below is the front and back of a backstage pass form the 1987 Wang Chung tour: The band kicked off the U.S. part of the tour with a February 27, 1987 performance on the Johnny Carson Show. This "Tonight Show" appearance set the band off on there way to performing well over twenty successful U.S.and Canadian dates. Then, in late April 1987 the band returned to Britain for another month of touring. In June 1987 Wang Chung with Bryan performed in Montreux, Switzerland during the annual Montreux Rock Festival and International Music and Media Conference. Their performance was later broadcast on "MTV's Montreux Rock Festival Weekend" on June 20 and 21, 1987. While the band was on hiatus from touring, Bryan also played a few cuts on Wang Chung's last album, "Warmer Side of Cool:" Bryan also appears in the video Praying to a New God off the Warmer Side of Cool album. Here are two screen shots of Bryan from the video plus four more screen shots from the video: Next stop ... REO Speedwagon ... Wang Chung had just broken up, and Bryan was playing some dates with The Spencer Davis Group, a couple of “showcase bands,” and doing some sessions in L.A. Bryan was recommended by two different sources for the REO audition. 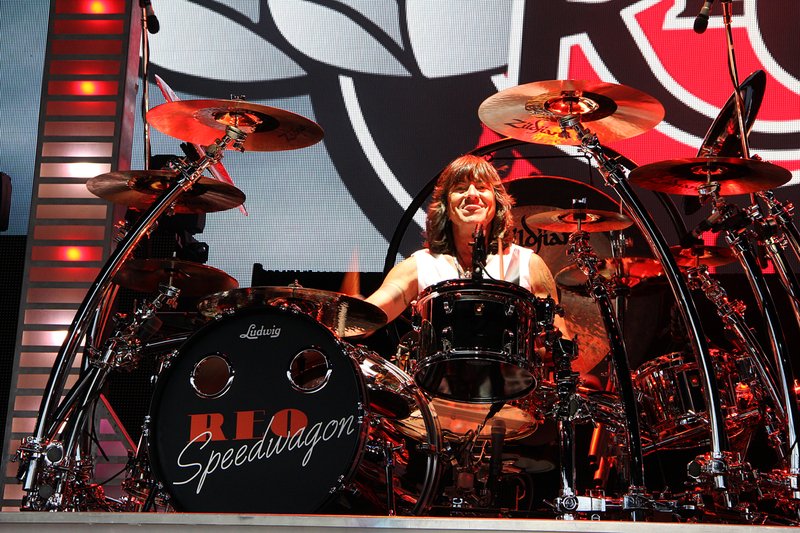 Bryan had met Dave Amato, new REO guitarist at the time, at another audition and he suggested Bryan to the band. Bryan had also met lead singer Kevin Cronin’s girlfriend and future wife, Lisa, who worked for Giffen Records at a showcase with one of the other bands he was playing with. She wasn't too impressed with the band but was very complimentary about his playing and told him that REO was looking for a new drummer. Bryan was the first of about twenty-five drummers to audition. Kevin told Bryan after playing “Roll With The Changes” that the song felt better than it ever had before. Bryan got the gig, but out of professional courtesy, the band still listened to the remaining drummers over the next few days. A significant point to note is that Bryan brought his 1920's Ludwig Stipple Gold snare for the audition. 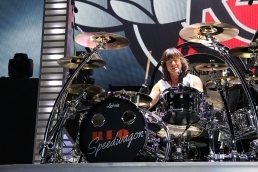 Kevin Cronin was so impressed by the snare drum that when Bryan showed up to the first rehearsal without it, Kevin remarked that the band hired not only Bryan ... but the snare drum as well. Here is a photo of Bryan just before he took the REO drumming throne: Soon after, Bryan played his very first REO show at the Baccanal Club in San Diego. 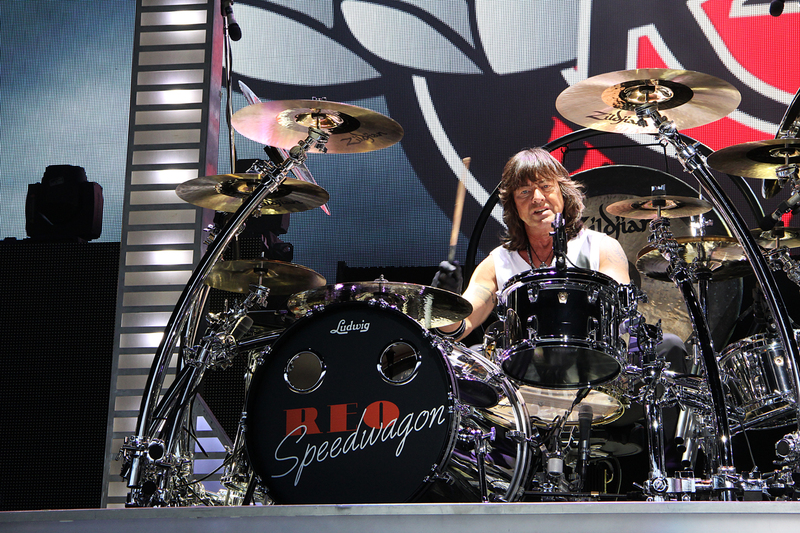 1989-Present Day Since late 1989 , Bryan has toured, recorded, and provided the rock-n-roll beat of REO Speedwagon. 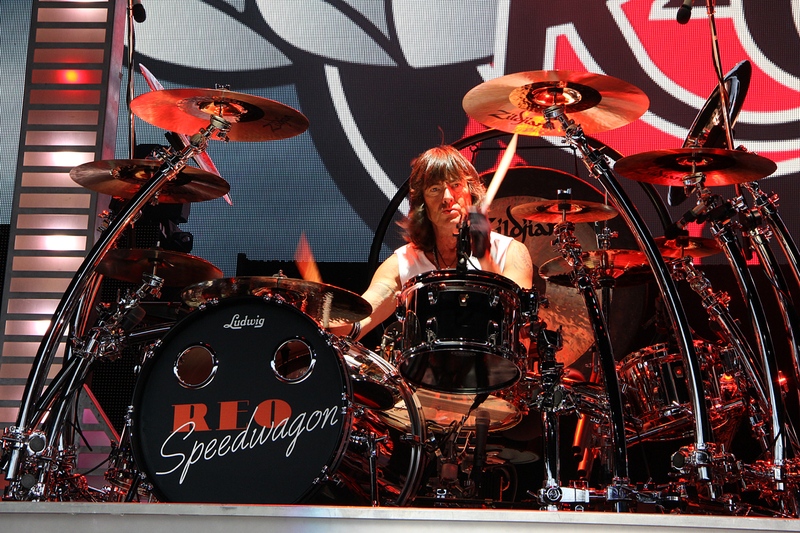 His powerful style of drumming has propelled the band through its last three albums and countless tours. His established catch phrase "Hitt 'em Hard" is more than just a catchy slogan. Bryan really does play the drums hard. During the course of a touring year with REO he has been known to break at least 10 cymbals. In addition, every night at least 5 drumsticks will break or almost break in two. He has been known to ice his forearms after a hard night of playing. Above: Bryan with REO in 2001 The aggressiveness in which he plays contributes to his own unique identifiable sound and style. 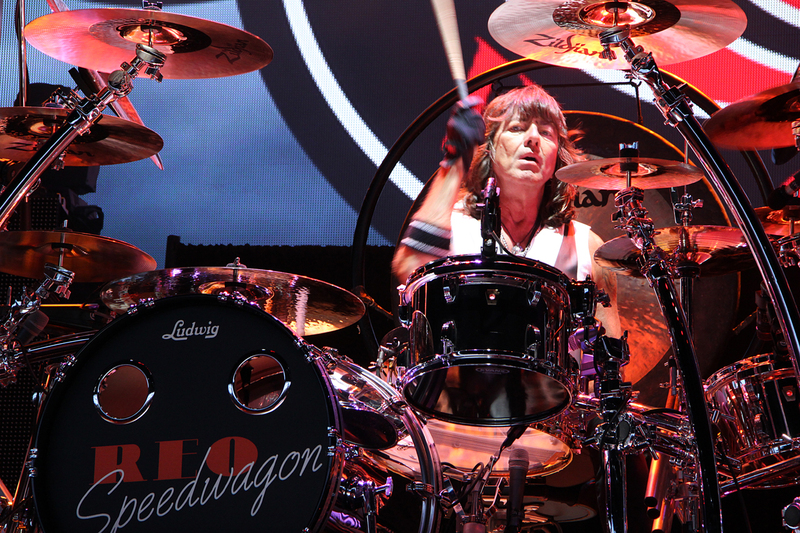 As for REO, the band is still recording fresh material and can be counted on to tour every year. 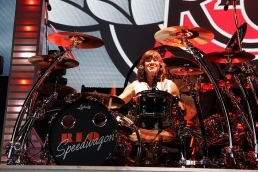 In 2007 and 2008 REO not only scheduled and performed an aggressive tour in the United States, but they toured in Europe as well. In 2008 they also toured in the Caribbean and they constantly work to keep bringing long time REO fans to their feet, as well as gain new ones. As for Bryan, throughout his career he has continually raised the bar for himself and those around him through his strong desire and concentrated effort to be the best drummer possible. 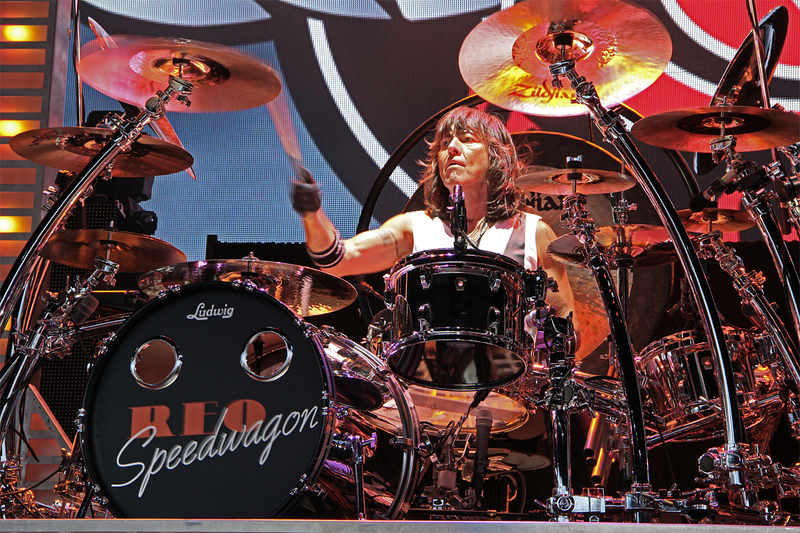 The desire for Bryan and REO to tour and come up with new songs and ideas is unstoppable. Their 2009 tour with STYX and .38 Special and studio recording with STYX sums it up best: Can't Stop, Can't Stop Rockin.